This model which sold for about � when first introduced in 1974 remained in production until 1979. Today good examples of this radio are worth in the region of �. 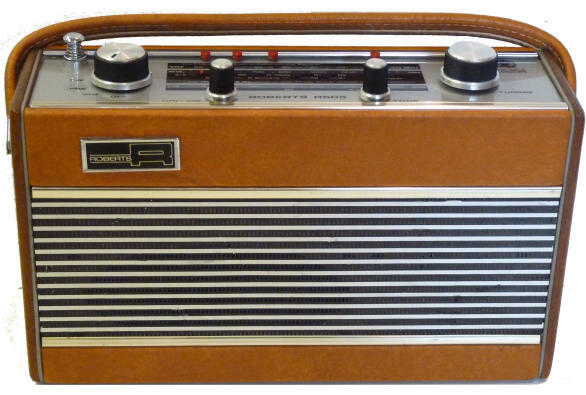 This radio was donated to a charity shop. Colin Davies who checks electrical equipment donated says he gets large quantities of stuff that is perfectly OK, but which the shop can't sell because it is faulty or there is no demand for it. I made a small donation to the charity and paid for its postage. It was in need of a good clean and repair to the 9 volt socket when I received it. The connection to the centre pin of this socket was corroded and had come adrift and was shorting to the connector for the sleeve. After some difficulty the pin was soldered to the connector using a small piece of wire.